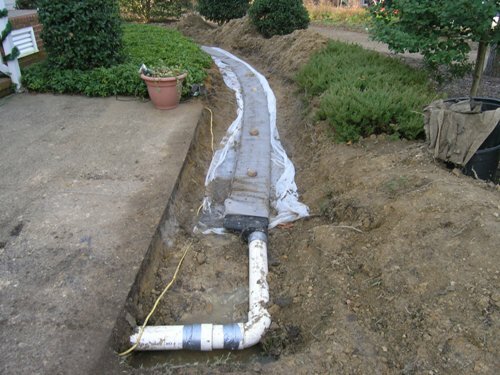 The drainage problems at this residence had been developing over the course of a decade. Years of inundation, misplaced irrigation, and overgrown plantings had changed the flow of runoff and resulted in channeling and pooling of water at various locations around the house. Several attempts had been made to alleviate the problems, but they were merely ‘Band-Aid’ solutions to the underlying problem. 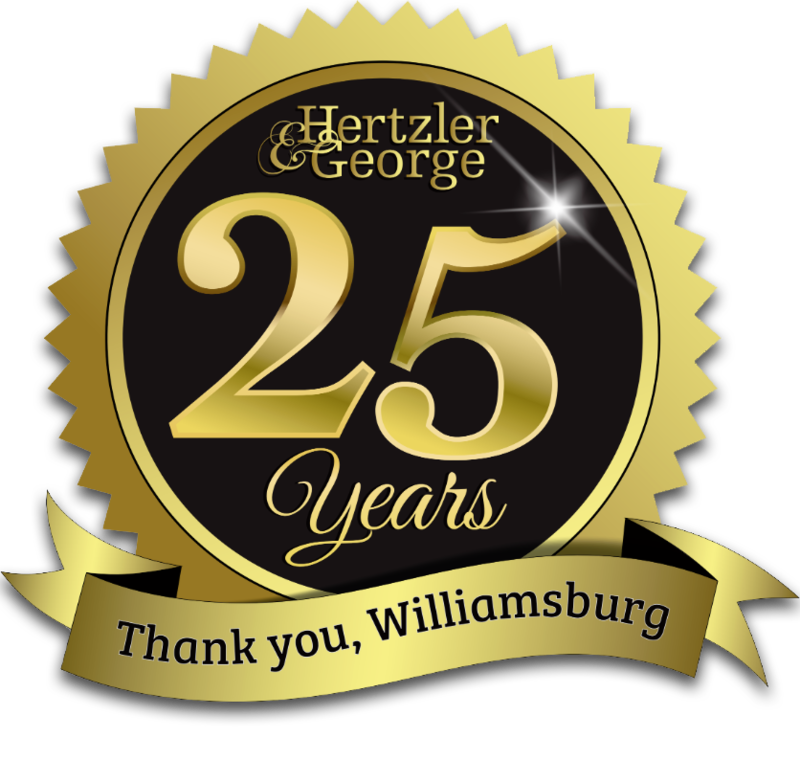 Our task was to design drainage solutions that would fix these issues once and for all, while also protecting and enhancing the existing landscape. 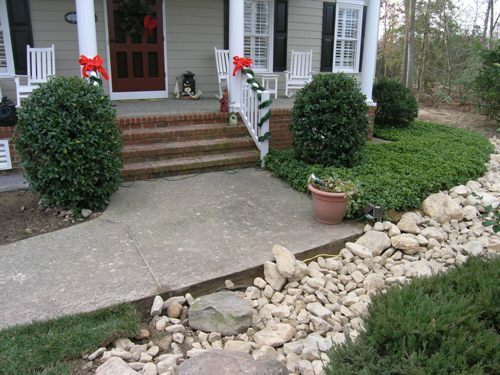 Poor Grading – Yards may not have enough slope to drain properly, and may even drain slightly toward the house. Undersized Ground Gutters – Ground gutters often don’t extend far enough away from the home to be effective during medium or heavy rain. Poor Subsurface Piping Decisions – Many problems can arise from inadequate underground drainage systems: pipe diameters that are too small, improper pipe outlet locations, little to no pitch over long distances, lack of clean-outs at turns in the pipes, inferior materials, poorly located drain boxes, and improper sizing and use of dry wells. Water Damming and Restriction – Landscaping features like raised planting beds, added after a home is established, can sometimes change or block the flow of water and create unwanted pooling. In other locations, they may channel and intensify the flow of runoff, causing bare surfaces and erosion. Tight Lot Space – Since drainage plans are typically designed to address a single lot rather than an overall neighborhood, they often employ shortsighted local solutions to larger scale drainage problems. And the restricted space within a single lot will sometimes require creative solutions to address what should be a simple drainage problem, i.e. getting water to flow across a slope instead of down a slope (most likely to because you don’t want to drain onto a neighbor’s property). When evaluating a property, our initial approach is to assess problem locations around the property, develop a map of where water is flowing, and formulate a plan for where water should be directed. 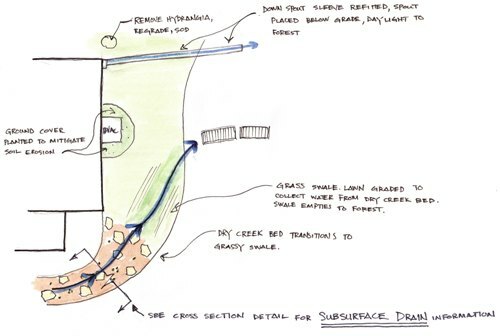 This information is used to develop a master plan that addresses water movement throughout the entire property and implements drainage solutions at specific locations. Move your cursor over the various areas to learn more about the various drainage problems in the yard. The front side of the house displayed the greatest amount of erosion. The main issue was what to do with the water that was draining from the flower beds next to the house and carving a channel along the front of the planting bed. Water from the channel poured onto the front walkway, pooling in a low spot near the front door. Soil carried from the upper flower beds had been settling in this area, creating an unsightly mess. The accumulation of dirt eventually caused the surrounding lawn to mound up and prevent water from draining out of the area. Once limited only to large storms, pooling was now occurring even during light rains and whenever the irrigation was turned on. The dominate feature here is the concrete driveway. At the end of the drive the lawn slopes steeply away from the house. There is also a dry creek bed that was meant to carry runoff from the driveway to the wooded area below, but due to its improper construction, the creek bed only managed to carry runoff halfway down the slope before it was breached. This created a channel along the edge of the lawn next to the wooded area. The channel was deep, the result of swiftly moving water. Water eventually exited the property at the same location as a newly designed concrete walkway. In the backyard, water from the roof spilled onto a ground gutter that was supposed to lead into a drain pipe. But, judging by the amount of erosion along the gutters, storm water from the roof has been overshooting the gutters, eroding the planting beds and bypassing the pipe system entirely. 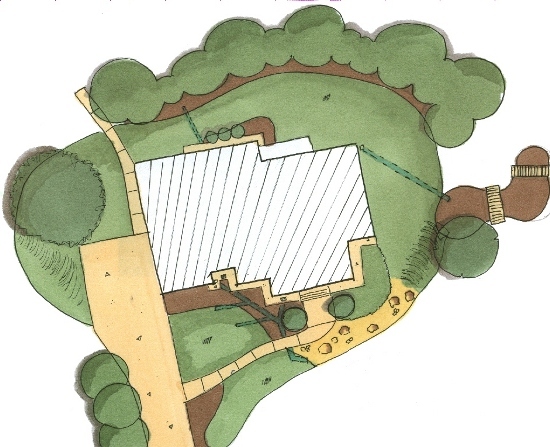 Mulch and soil washed across the sloping beds, pushing the bed line farther onto the lawn with each rain. Water traveled from the front of the house to a low point on the south side through a degraded underground pipe. This pipe also collected water from the front roof via a ground gutter, as well as water overflowing from the front sidewalk. Locations along the pipe system were discovered to have little or no fall and at times ran “uphill”. Around the fenced-in HVAC unit at the side of the house, the topsoil had eroded, exposing the clay subsoil. Attempts had been made to plant the area with groundcover, though without success. Move your cursor over the various areas to learn how we implemented our solutions.